FILE - Central Intelligence Agency (CIA) Director Mike Pompeo testifies during a Senate Intelligence Committee hearing on "Worldwide Threats" on Capitol Hill in Washington, Feb. 13, 2018. CIA director Mike Pompeo traveled to Pyongyang for a secret meeting with North Korean leader Kim Jong-un, according to multiple media reports. The meeting to prepare for direct talks between U.S. President Donald Trump and Kim took place over Easter weekend, according to unnamed officials reported by several news outlets. Trump acknowledged Tuesday the United States had held direct talks at high levels. A few minutes later, at the start of dinner with the Japanese couple, the president was again asked the same question. Within minutes, White House Press Secretary Sarah Huckabee Sanders also knocked down any confirmation of direct communication between Kim and the president or his top officials. “In regards to talks with Leader Kim Jong Un: The president said the administration has had talks at the highest levels and added that they were not with him directly,” Huckabee Sanders said in a comment emailed to reporters. 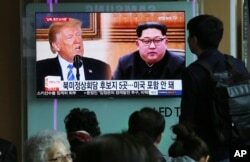 People watch a TV screen showing file footage of U.S. President Donald Trump, left, and North Korean leader Kim Jong Un during a news program at the Seoul Railway Station in Seoul, South Korea, April 18, 2018. Shortly after, in an extended bilateral meeting, Trump revealed that in preparation for the summit “we have also started talking directly to North Korea. We have had direct talks at extremely high levels.” But that response did not mention Kim by name. President Donald Trump and Japanese Prime Minister Shinzo Abe smile during their meeting at Trump's private Mar-a-Lago resort, April 17, 2018, in Palm Beach, Florida. ​Trump also said Seoul has his blessing to try to negotiate with Pyongyang an end to the 1950s Korean War. South Korean President Moon Jae-in and North Korean leader Kim are scheduled to hold a summit April 27. A senior South Korean presidential official said Wednesday the peace talks are a possible subject, but that the discussion of formally ending the war would need to involve the other relevant parties. Active combat in the war ended in 1953 with an armistice signed by the United States, which commanded the United Nations forces, North Korea and China. South Korea was not a signatory, and the two Koreas have never established diplomatic relations. Abe expressed relief that Trump pledged to address with Kim issues of concern to Tokyo, including abductions of Japanese citizens over decades. He praised the U.S. president for maintaining a tough stance toward Pyongyang’s nuclear weapons and ballistic missile programs. “Donald, you demonstrated your unwavering determination in addressing the challenge of North Korea,” the Japanese prime minister told Trump. 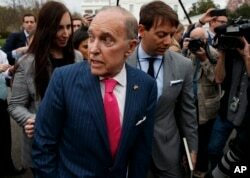 FILE - White House chief economic adviser Larry Kudlow talks with reporters outside the White House, April 4, 2018, in Washington. According to Larry Kudlow, assistant to the U.S. president for economic policy, “a lot of key issues are on the line” during the two days of talks between Trump and Abe. The discussions Tuesday at Trump’s resort off Florida’s Atlantic coast focused on North Korea and turn to trade issues Wednesday, according to White House officials. “We’re certainly going to be taking into account the full range of threats North Korea poses to regional security,” said Matt Pottinger, senior director for Asian affairs on the National Security Council. 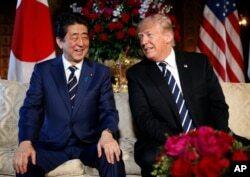 “I don’t think Prime Minister Abe will leave Mar-a-Lago with anything other than a high degree of confidence in the alliance,” Pottinger predicted. 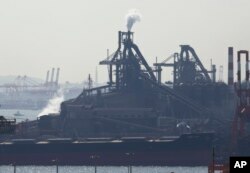 FILE- The factory of JFE Steel Corp. is seen in Kawasaki, near Tokyo, March 2, 2018. On a related topic, “the United States would probably like to see a free trade agreement (with Japan) come out at some point,” Kudlow told reporters early Tuesday afternoon just hours before Trump and Abe met. The economic adviser also said that “there’s nothing at all concrete” yet on the United States returning to what was the 12-nation Trans Pacific Partnership. “It will come up in the summit, no question about it,” added Kudlow, in reference to the TPP from which Trump withdrew shortly after becoming president. Trump has opposed the TPP and reiterated that stance in a tweet late Tuesday. Japan is one of the countries that agreed to join the trade pact, but South Korea is not. One unscheduled item appears to have been added to the agenda: “We’re going to sneak out tomorrow and play a round of golf if possible,” Trump told reporters on Tuesday afternoon.